Almost 80 years later, this film classic still gets us hooting and slapping and purchasing and dozing! 1. 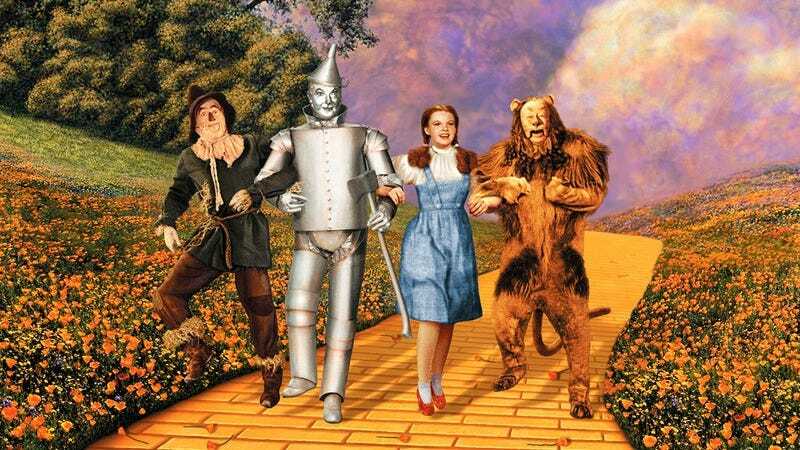 When the color kicks in: No one who’s seen The Wizard Of Oz will forget their first time watching vibrant Technicolor bloom across the screen when Dorothy finds herself in Oz. Even watching today, it’s impossible not to start screaming and applauding and bidding on tracts of Alaskan hinterland and nodding off as she takes her first steps into that fantastic land. 2. When Dorothy oils the Tin Man: The chemistry between those two still pops off the celluloid, and watching their first scene together, we just can’t help but let loose awful window-rattling whoops as we frantically bat our palms together and pour our inheritance into acre after acre of worthless property and then promptly lie facedown and faint dead away. No matter how many times you watch it, it still has that effect! 3. When the trees start hurling apples: As soon as that first apple is hurled, we’re already hoarse from the involuntary animal cries tearing out of our throats. The callouses on our palms have been torn back open from blow after blow after blow, and we’re tearing splinters out of the floorboards with our knees as we clap and howl and writhe. We sound like an a cappella group freaking out on salvia. Not only that, but we’ve also bought up every foreclosed farm we can get our hands on and capped it off by plunging deep into a dreamless void we’ll have to claw our way back out of if we ever want to escape. 4. When the flying monkeys show up: If you ever see us snoozing on the floor of the bank, clutching dozens of land titles to our chests in throbbing pink palms or hear our guttural roars wafting out of long-vacant lots, chances are we just caught a few frames of flying monkeys. That’s really all it takes. 5. When the real wizard is revealed: The moment when Dorothy & co. reveal the man behind the curtain is a stone-cold classic, and just like it must have for audiences in 1939, it never fails to start us screeching and windmilling our arms and bowing and mortgaging our homes and burying documents and discovering inner stillness and getting shot by rifles and overheating and sinking. If anything, watching it with modern eyes just makes us buy land and sprint and pulsate and crawl under our bed and pass water and declare bankruptcy all the more! Any Oz fan knows the feeling well! 7. When Dorothy sees her family again: Gets us loud, thrashing, prosperous, and comatose Every. Damn. Time.